The Mushroom Fan Club is Elise Gravel's love letter to fungi (and her family's favorite pastime) in the form of a field guide. This marks the sixth book by Gravel I have reviewed in two years and I am a lifelong fan. Gravel is the author and illustrator of amazing picture books like The Cranky Ballerina, middle grade novel series like Olga and the Smelly Thing from Nowhere and graphic novel biographies like The Great Antonio. Her non-fiction, If Found . . . Please Return To Elise Gravel is a magnificent look into the creative, curious mind of an artist as well as encouragement and inspiration for kids and adults to not be shy and create. Gravel begins The Mushroom Fan Club, "You know what I love? Walking in the woods and looking for mushrooms with my kids. It's like a treasure hint that nature organized just for us!" Gravel loves exploring nature and she also has a flair for anthropomorphizing everything. Her enthusiasm for fungi jumps off the page and she definitely makes them engaging by giving them eyes and mouths. 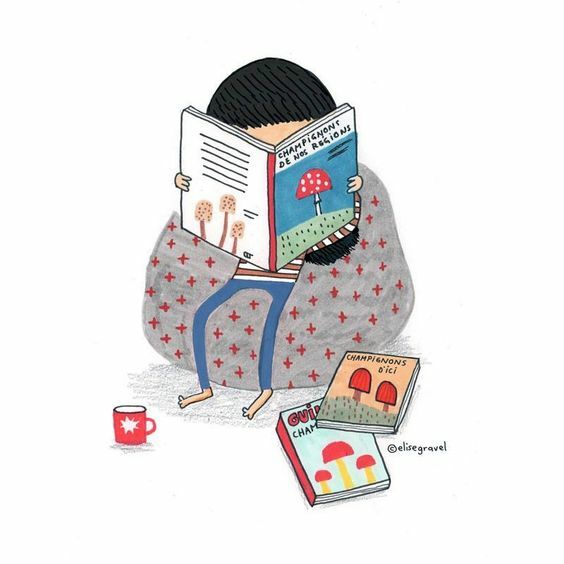 Inviting readers to come for a walk with Gravel and her mushroom treasure huntering, she writes, "I'll introduce you to some of my mushroom buddies. But first, I'd like you to follow these two rules: 1) Protect their environment and 2) DON'T EAT THEM! Many Mushrooms are poisonous. 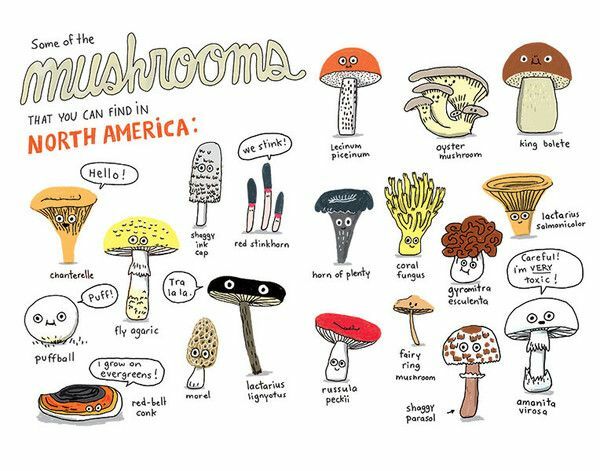 Only grown-up mycologists know for certain which ones are safe to eat." With that, she goes on to detail many mushrooms, stinky and strange, beautiful and delicious. 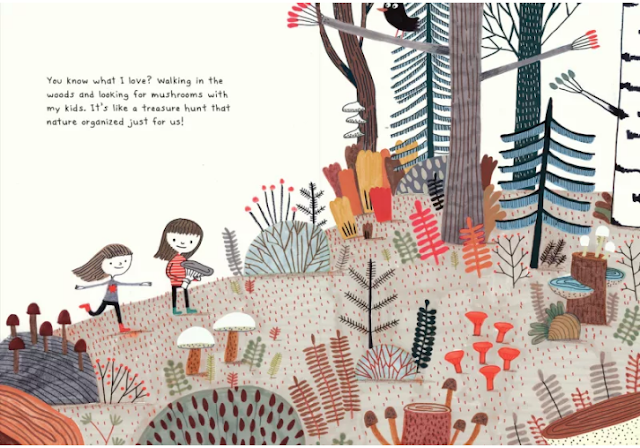 There are even the very fun to stomp on specimen, the puffball, accompanied by a very fun illustration of Gravel's daughter stomping away on a patch of puffballs. 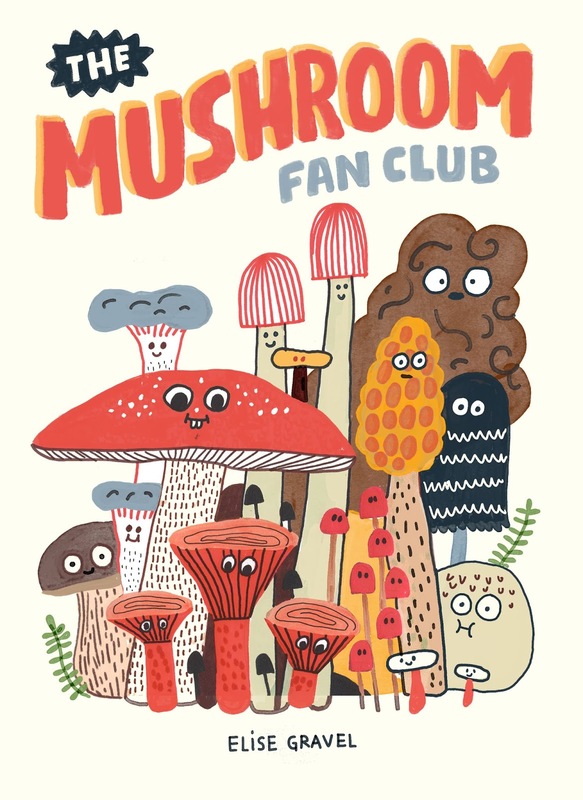 While I am pretty sure I would never pick up a mushroom field guide for adults to flip through, Gravel's The Mushroom Fan Club is instantly engaging and highly readable. I learned fascinating facts about something I will probably never get the chance to see in nature or on my plate, but am now inspired to seek out! 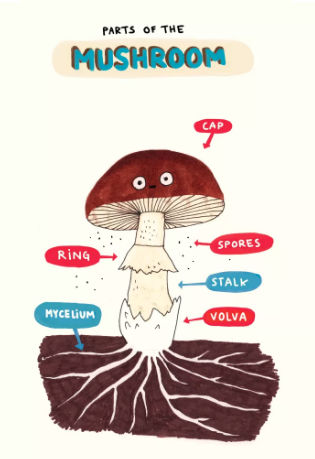 Gravel wraps up her book with "Mushroom Facts" (the super mushroom from Mario is the poisonous fly agaric), "Things that happened to me while hunting," (came face to face with a porcupine AND walking into a wasp's nest) and instructions on how to make a "Spore Print."